The “Washington Post” several months ago reported on the rapidly growing middle class in Mexico which is fast becoming the country’s largest demographic. The shift is a welcome addition to the gap between the rich and poor in Mexico. The strength of Mexico’s middle class is evident in the growing popularity of Wal-Mart’s and Costco’s throughout the country; the increasing number of new sold cars; and increased use of Mexican bank credit cards. A new luxury for the emerging middle class is to have the time and money to worry about their child’s nutrition and fitness; to join a health club for themselves; to take family vacations. Mexico’s rising middle class does not belong to only one of the country’s major political parties. Many of them are socially moderate and fiscally conservative: understandable given the work they have had to do to achieve their status. This demographic appears to be wary of politicians in general. They show concern at the polls about the loss of the country’s recent economic gains. If they become a strong voice, they can affect some of the fiscal policy and reforms by the government. Heretofore, there has only been the voice of the rich and powerful, using the poor to buy votes. Mexico’s central highlands are where a large majority of the emerging middle class live in thriving industrial cities, far from the coastal tourist hotspots and the drug wars raging along the country’s northern border and sea resorts. Queretaro, two hours north of Mexico City, has more than a million residents who live in attractive new subdivisions; raise families in safe neighborhoods; and enjoy a wide variety of white collar employment. I have recently experienced what properties the middle class looks for in real estate in Vallarta. Showing buyers homes in residential neighborhoods with safe parking for a price tag of $140,000-165,000usd price range has given me confidence in the viability of a market. 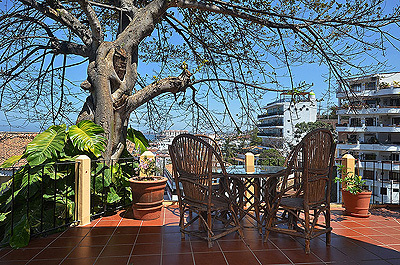 In this price range, we found many homes for sale in Mexican pesos. More nationals and the expat middle class can take advantage of a peso price. We have looked in the inland areas of PV, where prices are more attractive when an ocean view is not a requirement. We have found up to 185 M2 homes (for this article I will stay in US dollars) for as much as $165,000usd. Typically we can find 2-3 bedrooms with study, 2-3.5 baths, a back yard, front entry parking, located near parks and close to shopping. As most of the lots are the narrow rectangular style historic from Spain and France, these homes are two stories. We would think of them in the US and Canada as town homes, as it is standard to build the side walls of each home right up to each other. The good news is there are no issues of side windows to take away the neighbor’s privacy. These neighborhoods are usually quieter, have speed bumps to discourage speeding, and schools nearby.